IM24CA – Melges 24 Corinthian European Champion 2016 and runner-up of the 2017 Melges 24 Worlds in Corinthian division-GILL RACE TEAM GBR694-has been also very consistent to win the Melges 24 European Sailing Series overall title twice and the Corinthian title once-achievement which no other team has done. Having taken part of all the events of the 2017 Melges 24 European Sailing Series, not missing even one of the 51 sailed single races, Miles Quinton’s GILL RACE TEAM GBR694 (GRT) with Geoff Carveth in helm is the overall winner of the 2017 edition of the Melges 24 European Sailing Series, replicating their success of 2015. Besides Miles and Geoff in GRT were competing through the 2017 season Christian Birrell, Dan Schieber, Liam Gardener, Raffy Quinton, Ellie Meopham, Josh Grom Wilce, William Goldsmith. After six events that moved all over Europe, from Portoroz in Slovenia to Riva del Garda in Italy, Marstrand in Sweden, Helsinki in Finland, Medemblik in the Netherlands and Luino in Italy, the winners of the 2017 edition of the Melges 24 European Sailing Series were crowned in Luino in October. Piret Salmistu, Administrator of the International Melges 24 Class Association (IM24CA) interviewed Miles Quinton, the owner of GRT and Vice Chairman Europe of the International Melges 24 Class Association after their successful 2017 season. Discovering Miles‘ passion for Melges 24 back to 1998, he is still having a lot of fun in the Melges24 racing against the best sailors in the world and has no plans for stopping yet! The second part was interviewed by IM24CA Event Press Officer Mauro Melandri and can be watched as video edited by Zerogradinord. Miles is talking about their 2017 season and gives a preview about 2018. 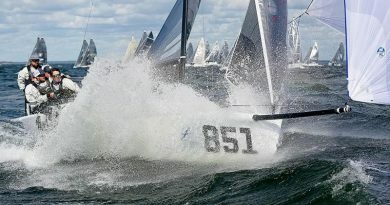 IM24CA: When was your first experience with Melges 24? How was it? What was inspiring you? Miles: My first experience in a Melges24 was leading up to the Worlds in 1998 in Torbay. We had seen the Melges24 at the London Boat Show in Earls Court and thought what an exciting boat it could be and our opportunity came when someone who I bought a boat at that show was looking to sell it without ever having sailed it. That boat was GBR334 The Woolwich co-owned between a group of sailing mates. IM24CA: When the team of GRT was created? And how your crew has been changing? Miles: I started my own campaign in 2006 with GBR654 and then added a US boat in 2007 GBR694. We became Gill Race Team four years ago when Geoff Carveth and I got together to sail the boat. I had heard of Geoff’s success in SB20 and many other classes so thought a partnership between us would be brilliant and so it has proven to be. Geoff brings not only great skill as a helmsman but also a chilled vibe that suits that way I like to sail. We have had a number of talented sailors in our team over the past years and this year we were lucky enough to have friends Christian Birrell, Dan Schieber and Liam Gardner join us. IM24CA: What’s the background of your crew – on what boats you have sailed before Melges 24? Miles: Christian our tactician won silver in Kiel in 470s, is a former Fireball World Champion and UK National Champion in 470, Merlin Rocket, Fireball, Enterprise, and GP14. Liam our jib trimmer was the first under 16 Firefly champion and competed at the Laser Radial World Championships in Japan, jib trim and Dan Schieber our bowman competed high level in 420 and 470 Class. Geoff and I are pleased to have such talented young guys sailing with us, as it’s built based on Geoff’s deep experience of winning three SB20 World Championships and numerous other titles. IM24CA: The highlights of GRT have been Corinthian European Champion 2016 and 2017 Corinthian World‘ second and Overall 8th; European Sailing Series Overall winner 2015 & 2017, Corinthian division winner 2016. Which achievement is the most valuable for you and why? Miles: We think that getting on the podium at a Europeans or Worlds is the highest achievement as it pits us against the very top teams from across Europe and the US, so wining the European Corinthian title in Hyeres was very special even though we missed out on the bronze medal overall. We have not yet won the World Corinthian title this year this is our medium term goal. We love the European Sailing Series as this is as different kind of test with six events in very different locations so it is a test of consistency throughout the season and we are very honoured to have won ESS overall twice and the Corinthian title once which no other team has done. 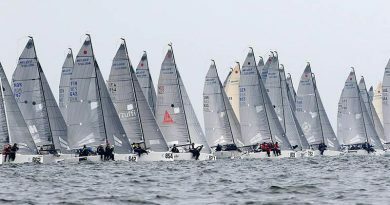 IM24CA: What venue and which event (they can be different) you have liked the most sailing Melges 24 and why? Miles: This is a really hard choice as they are all amazing in different ways – we love the classics sailing a Melges 24 in Garda is always a very special experience and we are really looking forward to the Europeans there in 2018. However, we also love sailing in new locations so the Worlds in Helsinki was unique and we really enjoyed the sailing and the place. 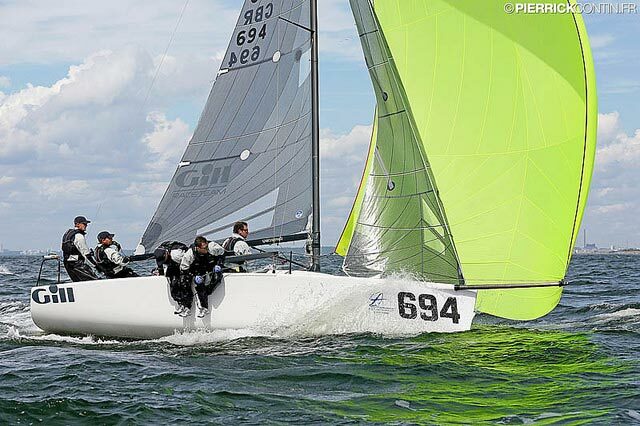 IM24CA: What do you like about the Melges 24 class and boat? 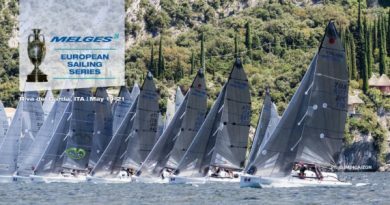 Miles: What we like about Melges 24 is the standard of competition is so high and the boats are so much fun to sail that it is really a Grand Prix class sports boat that cannot be matched by other classes. When you win something in a Melges 24 event whether it is big or small you really feel like you have achieved something in sailing. IM24CA: What have been your greatest and enjoyable moments sailing in Melges 24 class? Miles: There have been so many great moments that it is difficult to pick just one! Coming 5th at the Worlds in Middelfart in Denmark was very special but if I had to pick one it would be winning the 2016 European Corinthian title on the last race of the last day of the championship by a count back it was so close. IM24CA: What are your future plans on Melges 24? Miles: We are still having a lot of fun in the Melges24 racing against the best sailors in the World and making good progress so we feel that there are a still some goals that we have yet to achieve that are possible! In the short term retaining our European Corinthian title against top teams like Italian TAKI 4 will be a challenge so we are focused on next year and then we will see what happens! We have no plans for stopping yet!